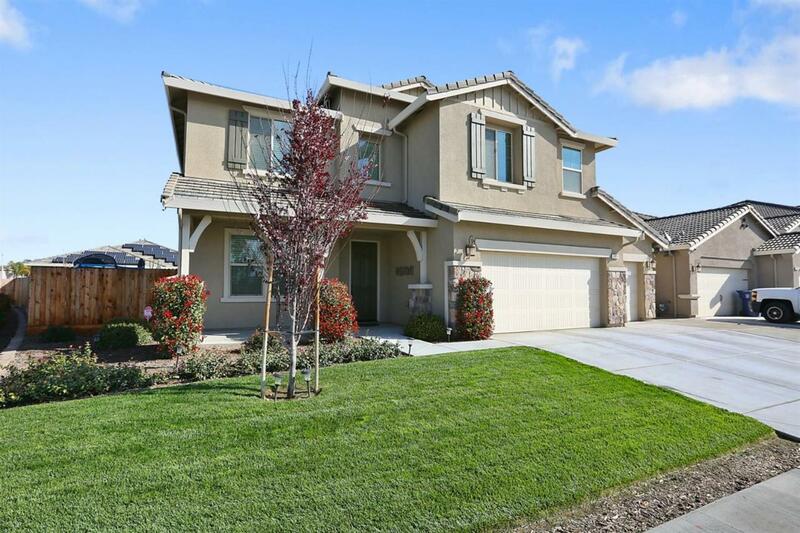 Stunning home on a premium corner lot now available in Tulare! This gorgeous Woodside Santiago'' plan with 5 spacious bedrooms and 3 bathrooms welcomes you home. You will love the well-manicured landscape, additional concrete along the side and back, and convenient automatic sprinklers. Impressive details make this house a home. From alluring upgraded flooring, and wrought iron stair rail to the oil rubbed bronze finishes, you will love every inch of this well-designed living space. The very open and functional kitchen offers gorgeous granite counters, stainless appliances, massive center island, and convenient pull-out drawers. You will also find an elegant formal dining, a generous laundry room, blinds throughout, and an oversized bonus room loft area. The extensive master suite offers a large walk-in closet and a luxurious master bath, with a grand soaking tub, a large shower and his and hers vanities. The backyard offers a covered patio and a large yard to play and entertain. Listing provided courtesy of Adrian Herrera of Bloom Group, Inc.